The Islamic State entered the camp on Wednesday despite attempts by the local Palestinian militias to hold them back. ISIS has taken the camp center and pushed local militias to the fringes. Government forces have laid siege to the camp for more than 700 days and remain around the camp. On Sunday they also dropped ‘barrel bombs’ and launched artillery strikes on the camp. The Assad Regime has suffered a string of defeats. Just last week, Al Qaeda affiliated Al Nusra took over Idlib, a region close to Turkey. That was the largest blow to the Syrian government in two years. Al Nusra, although clashed with ISIS in other parts of Syria, pledged their neutrality in the ongoing conflict in the refugee camp. 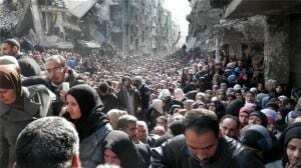 The refugee camp, also known as Yarmouk, was home to about half a million Palestinians prior to the outbreak of the Syrian Crisis. About 18,000 are still currently besieged and trapped within the camp. Palestinians within Syria have been forced to decide whether to support the populist uprising against Assad or to defend the Assad Regime. Speaking for the Popular Front for the Liberation of Palestine, a group allied to Assad, Anwar Raja mentioned how several pro-regime militias within the camp have organized to repel ISIS. Raja also stated that ISIS has already killed or kidnapped about 100 civilians. Noting the situation and the plight of Palestinians caught in-between the conflict, Palestinian Authority President Mahmoud Abbas remarked how Palestinians “pay the price” while the conflict rages on. Yarmouk lays only a few kilometers from the Presidential Palace.